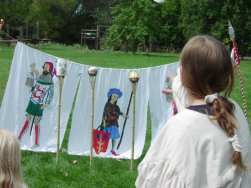 This section covers large-scale events, such as themed feasts, quests and entertainments involving the bulk of the populace attending an event, rather than individual activities (see the latter here). I believe that the difference between a lousy or just plain dull event and a good one lies in the attention paid to the details. The events which stick in my mind are those where people have made the extra effort to help me step out of the mundane world. This can include feasts, quests, tourneys - anything, so long as it's more than just a souped-up fancy dress gathering. And bonus points for including material sourced from period so that I can learn as well as have fun. We are blessed in Southron Gaard with a number of excellent, competent cooks, so you can guarantee, for the most part, that the kitchen will run smoothly and the food be edible, on the rare occasions when it is not utterly delicious. So food aside, I think that a feast can rise or fall on how it is presented. I like themed feasts, I like entertainments - I'm not there to talk about my computer problems or the latest episode of Buffy. I appreciate it when feast stewards go a little further to make the Dream real, whether by matching entertainment to a feast theme, dressing the hall, announcing the food or making up a printed menu, doing a fancy subtelty, or providing some form of theatrical entertainment. When Mistress Taddea asked me to help out with some ideas on how to "dress" her feast at Canterbury Faire in AS48, I was intrigued. 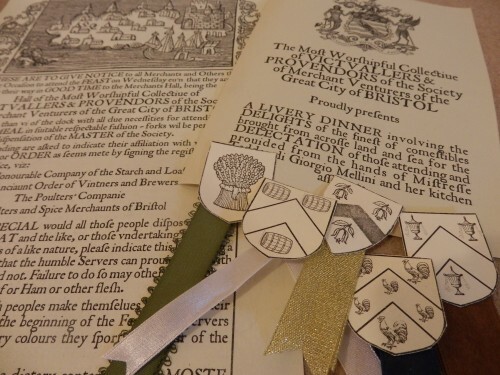 Her initial concept was to present the courses as gifts from the heads of merchant guilds, along with stamped bread, based on the sort of thing the merchant venturers were doing in Tudor Bristol (see the Trade, Guilds and the Red Books section here). Gifts, I figured, would relate to the various merchant guilds or companies, so we worked out the likely groups, thought about how to represent them and it all came out of that. I'd bought a book,Ceremonial Barges on the River Thames (Palmer, 1997), which had a wealth of information about the style, symbols and pageantry of the livery companies of London. So the Canterbury Faire feast was presented as The Livery Dinner of the Most Worshipful Collective of Victuallers and Provendors of the Society of Merchant Venturers of the Great City of Bristol. I also made up a large batch of shield-shaped tokens used to identify each company, based on the arms of the relevant London livery companies, tagged with different coloured ribbons; the head servers and Cook got a special gold ribbon with the arms of the Cook's Company (a columbine apparently representing ginger, according to Palmer, pg 114); the kitchen crew seemed particularly pleased to be acknowledged in this way. Badges could be seen later pinned to hats and bags around Faire. The symbols were used to identify the tables, with each place sporting a badge, along with certain symbols of their companies scattered over the cloth (ie feathers for the Poulters, grape leaves for the Vintners, wheat sheaves for the bakers, and old peppercorns and cinnamon quills for the spice merchants). It was a nice way to identify the tables, if a tad messy to clear afterwards. The High Table had, given our Bristol theme, a nice long red cloth for a table runner. The Cittie of Bristol, beinge an Ancyent Towne of this Realme, hath allwaies bin inhabited and vsed by and with a number of Marchaunte Aduenturers of the same Citty vsinge trafficke and marchandize to and from beyond the Seas, By reason whereof the same Citty hath not heretofore bin only greatly enriched, and the Inhabitants of the same of all Science verie well occupied and sett in worke in and aboute theire seuerall Arts misteries and occupacons. Noe manner of person or persons dwelling or that hereafter shall dwell within the said Citty of Bristoll, or the Subbirbes or Liberties of the same, shall vse or exercise, by himselfe, or by anie other, the recourse or trafficke of marchandize beyond the Seas, vnlesse the same person or persons bee nowe made, or hereafter shalbee admitted to bee, of the saide Societie or Corporacon, Or els that hee or they have byne, or shalbee apprentice or apprentices, and served in and to the saide Arte or misterie of Marchaunts within the same Cittie or Liberties of the same by the space of seaven yeeres uppon paine of Forfeiture of all the goods and marchandice that hee or they, or any of them, shall att anie tyme after the Feast of Sainct John the Baptist soe vse, carry, transporte or convey to or from beyond the Seas contrary to the tenure aforesaide. The courses were all heralded with some lovely impromptu schtick going on between Lady Nimue, as feast herald, and Don Gregory, as fanfarist. I particularly enjoyed the strangled horn-work as a napkin slowly worked its way out of the end of the good Don's instrument. The servers marched out in unison to present the food, with the High Table served first as the announcements were made. The first course was a gift from the Poulters� Company and Salters and Spice Merchants, with a representative dish of spiced chicken cuminade presented to the High Table by the highest-ranking peer of the Pouleters' Company, Sir Vitale. The second course was a gift from the Company of the Starch and Loaf, and included an Assize of Bread, where the bread was checked to see it met the regulation weight, a tradition stretching over hundreds of year. Lord Lowrens had very kindly and cleverly answered my challenge to make a set of scales on site in the days beforehand, so we marched in with Mistress Teffania as the Company representative to present the loaf. Your Majesties, Your Excellencies, Peers and gentry. Know that your merchants are honest and to demonstrate that, the Company of the Starch and Loaf here present the assize of bread, of ancient standing. Whereby when a quarter of wheat is sold at twelve pence, then wastrel bread of a farthing loaf of best white bread should weigh six pounds sixteen shillings. But Bread Cocket of a farthing of the same grain and bultel, shall weigh more than Wastel by 2 shillings. And Cocket Bread made of grain of lower price, shall weigh more than Wastel by 5 shillings. Bread made into a Simnel loaf shall weigh 2 shillings. less than Wastel. Bread made of the whole Wheat shall weigh a Cocket and a half, so that a Cocket shall weigh more than a Wastel by 5 shillings. Bread of Treet shall weigh 2 wastels, and bread of common wheat shall weigh two great cockets. Proceed with the weighing�.Behold! A loaf of perfect weight! A hearty cheer for the members of the Company of the Starch and Loaf, hip hip huzzah. Only a little slightly-obvious shenanigans were needed to get the scales to balance homestly�. The third course involved sweetmeats, including soused and sozzled dainties from The Anciaunt Order of Vintners & Brewers. The claret jelly, marzipan and wafers were accompanied by a magnificent subtelty from the ever-capable hands of Lady Ceina of Ballyhawk -- a large sugar-pane boat, which sailed in and around the hall to a tune commonly associated with those engaging pirates of the Caribbean, courtesy of the ever-obliging Don Gregory. The vessel came safely into port, docking at a sugary wharf where barrels of sweet treasure were off-loaded, to the delight and dental direness of all. The crescent moon heralds the harvest, promising a cornucopia to tide us over the winter to come. And thus we present croissants with Swithin cream, raspberries and blueberries. As the moon swells from crescent to the roundness of the harvest moon, so do the fruits of the field swell and ripen. We present fruit tartlets in honour of the fertility of our harvest and our Barony. The cutting of the wheat reminds us that death comes to us all, but we look to the future past the coming winter to rebirth in the spring. We present the lammas fruit bun and ask that you light your candles one from another to represent the light that will come. For the latter, everyone was given a fruit bun and the lighting started off with the high table and proceeded down the tables for the full length of the hall. A simple effect, but effective. We were asked to prepare an entertainment on the basic theme of the Black Death (to be honest, we were told it was 14th century and guess what sprang to mind...). The Plague and the Decameron provided suitable inspiration around which to build a series of divers entertainments. Will you rise or fall? This draws on the three main themes of the Decameron (Fortune, Love, Wit), and provides a clue for one of the challenges. Three of the kings from the Wheel of Fortune and a table name tag. I painted a Wheel of Fortune (a period one!) on a large sheet of cardboard which allowed us to pin the name tags in various positions to show whether the team was rising or falling on Fortune's Wheel. Some of the rising and falling was purely arbitrary, based on whether people were joining in or not, as well as how well they did in the challenges. I had my plain white penitent's garb for this, as the most suitable. Any plain dark overtunic would do; a monk's tunic would be great. Spoken: Everyone raise a hand. Put your hand down if you are wearing purple. Put your hand down if you have no head covering. Put your hand down if you have a metal bowl or plate to eat off. Add more if required until one-third of the original number is left with hands in the air. All those with hands still in the air, come to the centre. Give them a chance to cluster, turn them to face all the people left at the tables. The rest of your companions are dead. In the months from March to October 1348, Florence lost three-quarters of its people, of men and women, children and adults some 96,000 people died. Venice lost the same, as did Siena and Pisa. People fled the cities. Pampinea, Filomena, Ellisa, Dioneo, Lauretta, Filostrato and Panfilo are names from Boccaccio's Decameron, young lords and ladies who went to the countryside to avoid contagion. There they told tales to amuse and challenge each other and to shut out the world outside. And even so, in three short years, it is said that a third of the world died. To prove your wit, provide a translation for the words to O Fortuna on the rear of your feast menu. You have until the music ends. Once the music ended, we brought a representative from each table forward, lined them up and went through the translations one line at a time, starting with the correct translation, and running through the various attempts. They usually got the first line right, and then it was anybody's guess, with some very inventive attempts. At the completion, we handed out bookmarks to everyone, as feast tokens, which had the Latin on one side and the English on the other. You can fit eight bookmarks on an A4 sheet of 120gsm paper. As an extra touch, I made a hole in the bottom of each and threaded through some red and black wool, to match the feast colours. We got people to write their answers to the following questions, with points for being first, being correct, and even more points for being witty. The most interesting ones were read out, and the positions on the Wheel were adjusted accordingly at whim. Which sins caused the plague? During the plague, what three types of people are you advised to avoid? Loose women, gluttons and drunkards. And then we had a reading from the Decameron to pose a question to think about over the second course. Agilulf, King of the Lombards, took to wife Theodelinde, a lady very fair, wise and virtuous. It so befell that one of the Queen's grooms, a man born to very low estate, but not a whit less tall and goodly of person than the King, became inordinately enamoured of her. He had sense enough to recognize that his love was presumptuous, so disclosed it to none, nay, he did not even venture to tell her the tale by the mute eloquence of his eyes. He had no thought of declaring his love to the Queen, for he knew that 'twould be vain; but resolved to devise some means whereby he might lie with the Queen; by contriving to get access to her bedroom by passing himself off as the King, who, as he knew, did not always lie with her. He contrived to conceal himself for several nights in the great hall which separated the King's room from that of the Queen, and observed in what manner the King would go and return. Being bent on doing likewise, he found means to come by a mantle like that which he had seen the King wear. He then took a warm bath, and having thoroughly cleansed himself, that the smell of the foul straw might not offend the lady, or discover to her the deceit, he in this guise gained entry to the Queen's bed and without word said either on his part or on hers, he had more than once carnal cognizance of the Queen. Loath indeed was he to leave her, but, fearing lest by too long tarrying his achieved delight might be converted into woe, he left the room without a word, returned with all speed to his bed. A little later the King entered the Queen's room; whereat she wondered not a little; but said: "My lord, what a surprise is this to-night! 'Twas but now you left me after an unwonted measure of enjoyment, and do you now return so soon?" From these words the King at once inferred that the Queen had been deceived by some one that had counterfeited his person and carriage; but, at the same time, bethinking himself that, as neither the Queen nor any other had detected the cheat, 'twas best to leave her in ignorance, he wisely kept silence. Which many a fool would not have done, but would have said: "Nay, 'twas not I that was here. Who came hither?" Whereby he might have caused the lady needless chagrin, and given her occasion to desire another such experience. Angered and incensed beyond measure by the trick which, he saw, had been played upon him, he resumed his mantle and quitted the room with the intention of privily detecting the offender, deeming that he must belong to the palace, and that, whoever he might be, he could not have quitted it. So, taking with him a small lantern which shewed only a glimmer of light, he went into the dormitory which was over the palace-stables wherein slept all the men-servants slept in divers beds. What test did the King devise to discover, without alerting the household, who had counterfeited him? Which saint was associated with the plague? Bonus point for being able to cite what assisted him to recover from the plague. His dog, which brought bread every day into the forest where St Roch was sheltering. What are the three themes running through the stories of the Decameron? We revealed the suggestions as to the action of the king, adjusted the Wheel and then read the next part of the story. The King had determined that whomsoever had done that of which the Queen had spoke, his heart and pulse could not after such a strain as yet have ceased to throb. So he began cautiously with one of the head-grooms, and went from bed to bed feeling at the heart of each man to see if it was thumping. All were asleep, save only he that had been with the Queen, who, seeing the King come, and guessing what he sought to discover, began to be mightily afraid, insomuch that to the agitation which his late exertion had communicated to his heart, terror now added one yet more violent; nor did he doubt that, should the King perceive it, he would kill him. Divers alternatives of action thronged his mind; but at last, observing that the King was unarmed, he resolved to make as if he were asleep, and wait to see what the King would do. So, having tried many and found none that he deemed the culprit, the King came at last to the culprit himself, and marking the thumping of his heart, said to himself: "This is he". But being minded to afford no clue to his ulterior purpose, he did no more than with a pair of scissors shear away on one side of the man's head a portion of his locks, which, as was then the fashion, he wore very long, that by this token he might recognize him on the morrow. Having so done, the King departed and returned to his room. What can the groom do now to cheat his fate? We revealed the proposed answers to the second part of the story, changed the table markers on the Wheel, and finished with the third and final part of the story. The groom was fully sensible of what the King had done, and being a shrewd fellow understood very well to what end he was so marked. He got up without a moment's delay; and, having found a pair of scissors, he went quietly through the dormitory and in like manner sheared the locks of each of the sleepers; which done without disturbing any, he went back to bed. On the morrow, the King summoned all his men-servants, and, as they stood bareheaded before him, scanned them closely to see whether the one whom he had sheared was there. Observing with surprise that they were all sheared in the same manner, said to himself: "Of a surety this base fellow, whom I go about to detect, evinces a high degree of sense." Then, recognising that he could not compass his end without causing a bruit, and not being minded to brave so great a dishonour in order to be avenged upon so petty an offender, he was content by a single word of admonition to shew him that his offence had not escaped notice. Wherefore turning to them all, he said: "He that did it, let him do it no more, and get you hence in God's peace." Those who heard the King's parting admonition wondered, and made much question with one another, what the King might have mean; but 'twas understood by none but him to whom it referred: who was discreet enough never to reveal the secret as long as the King lived, or again to stake his life on such a venture. No doctors were to be found, because they were dying like everybody else; those who could be found wanted exorbitant fees cash-in-hand before entering the house, and having entered, they took the patient's pulse with their heads turned away, and assayed the urine samples from afar, with aromatic herbs held to their noses. The wheel characteristically bears on its rim four shelves of "stages" with four human figures. The figure rising on the left is usually labeled regnabo (I shall reign), the one at the top is marked regno (I reign) and is often crowned, that descending on the right is regnavi (I have reigned), and the writhing figure at the lowest point is sum sine regno (I have no kingdom). We wanted a bit of theatricality for Twelfth Night, and sought to combine some of the traditional Twelfth Night elements with our own SCA traditions. The references to the different gifts below follow their medieval meanings; the toasts are the ones commonly made at any formal occasion in these parts and so didn't require too much prompting of the populace to get them to join in. Enter the Star, a large gold star on a long pole. Great part for a child. Enter three Magi from the rear of the hall, carrying a gift apiece set upon a small cushion. The gifts were in gold bags, in keeping with the theme; the Magi wore cloaks and gold crowns of cardboard (use wide elastic at the rear and you can fit anyone's head with ease). They process through the hall, bow to the high table and place their gifts on a small table in front of the high table. The table has three charged drinking vessels for the Magi's toasts, and large-font copies of their toasts for them to crib from if need be. Voice-over: When the Three Wise Magi set forth in their quest, they took with them three gifts representing three states of man. First was the gift of gold, representing the authority of the king and those who rule in his name. Voice-over: Second came the gift of frankincense, the vapours of which rise to Heaven to remind us of all the things we can be. Voice-over: And the third gift was of myrrh, the oil that soothes our passage out of life and to death and what may lie beyond. All Magi: Long live Southron Gaard. Hip, hip, huzza. Hip, hip, huzza. Hip, hip, huzza. Long live Caid. Hip, hip, huzza. Hip, hip, huzza. Hip, hip, huzza. Magi bow to the high table and go back to their places. This was the first market I ran at Canterbury Faire (AS33), so I decided to dress it up a lot to encourage people to play. We kicked off by beating the bounds, basically herding everyone together with drum and whistle and ribbons and marching around the entire grounds, with me singing the St Thomas Faire Song written to mark places and people as we came across them. We produced just over 1,000 leather tokens (courtesy of a member working for a shoe factory), and stamped them tokens with a diverse range of symbols (holly leaves, tower, lily). Everyone was given a roll of eight tokens at the gate and encouraged to use them for trading, gambling and the like. The combination of symbols and different coloured leather tokens made our "currency" look interesting, and people started to collect the set. We let it be known that blue tokens were quite rare, and the event stewards had held back green tokens to give to specially helpful people. I made a batch of low-cost items to sell for tokens (drink bags, bath balls, bookplates), as well as some games which cost tokens (conkers, ring toss, shoot a light). We also had a suitably venal moneytrader at the market who swapped tokens and cash, or common tokens for rare ones at arbitrary rates. That was sneaky as it meant I got a lot of the tokens back to use the following year. The faire symbol was a gold-painted glove affixed to a stick, in the tradition of the pie powder courts of the middle Ages. Not sure if they had the middle finger extended though�And we had a three-legged race to see who would be crowned King and Queen of the Faire (won by Mistress Rowena le Serjent and Alvaro de la Rosa Negra, who performed their roles admirably). When we came to have the Market Court, things went delightfully over the top. The King and Queen appointed a court, with constables playing the heavy nicely (wouldn't have looked out of place outside a nightclub) and "fetching" people; the herald Lwelleyn playing "herald says" with the seated populace in suitably pedantic style; the court jester Bartholomew Baskin having a lot of unmentionable fun with the market glove. Whereas it has come to Our notice that through diverse silly efforts you have added considerably to the frivolity of Our Market Day, it is thus Our pleasure to award you the Award of L'Eggs. We at this time charge you with the responsibilities of this Most Noble Award and require you, in the presence of the populace, to take up your Award and go forth with another of your choosing, thereby to toss an egg between you until it be enow, or the egg break or the populace depart. Amusing for the populace, though I think the combatants weren't so keen on the thought. Maybe hard-boiled ones next time. Whereas it has come to Our notice that through diverse silly efforts you have added considerably to the frivolity of Our Market Day, it is thus Our pleasure to award you the Award of the Croissant Sword. We at this time charge you with the responsibilities of this Most Noble Award and require you, in the presence of the populace, to take up your Award and go forth with the most puissant warrior, thereby to engage in a pas du croissant until it be enow, or the croissant break or the populace depart. Whereas it has come to Our notice that through diverse silly efforts you have added considerably to the frivolity of Our Market Day, it is thus Our pleasure to award you the Office of the Golden d'Oor. We at this time charge you with the responsibilities of this Most Noble Office and require you, in the presence of the populace, to take up your symbol and scroll of office and make known to the populace the time-honored words of those who knock upon the door. Knock knock. Who's there? Warrior. Warrior who? Warrior been all my life? Knock knock. Who's there? Saul. Saul who? Saul the king's horses and Saul the king's men. Knock knock. Who's there? Thumping. Thumping who? Thumping wicked this way comes. Knock knock. Who's there? Wah. Wah who? Don't get too excited now! Knock knock. Who's there? Sherwood. Sherwood who? Sherwood like to stop telling these jokes. There were intimations of lesee majeste, so this was the only King and Queen of the Market ever held at Canterbury Faire, but a second market the following year meant that the market itself became an established tradition and one which is now very well patronised. That's no way to treat a Crux Australis (spot the flying "rock"). Crowned heads on a stake. 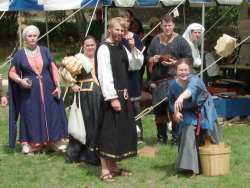 We began the Night of Champions as a means of providing additional entertainment for people remaining in our area a day or two after Canterbury Faire. It was run as a Swift Flight fundraiser, with Bartholomew and I usually putting together the theme and games, and the rest of the company providing assistance with running the event and the associated supper. The general approach was to develop a theme which would allow us to divide the attendees into a set of teams (usually four or five), and then run them through a series of games of different types, with a supper to follow. Teams were always selected at random, usually by getting people to draw tokens at the door as they came in. This was deliberate policy, to get people to mix more so than usual, particularly with new people or visitors. Typically each team was given a description of one or two of the games to study, and to decide which team member would undertake these. Each team was permitted to nominate a person once to answer any game challenge. So there was some strategic planning required to decide who would be best to do what and when. Each group was given 20 sweets to be used as bribes, such as bribing another team's challenger to "throw" an event, or to make way for an assassin. Victory to the group with the most bribes in hand at the end of the evening. Each team's assassin is given a sticky black spot. If they get one onto the person of an opposing group's leader before being discovered, the victim's state/city/clan is deemed to be leaderless, rioting, and forced to miss the next two challenges. If the assassin is discovered, they can't take part in any subsequent challenges. A small truce area is provided during refreshments. This was one way of ensuring team bonding! Team representatives were sent out of the room, with one remaining in the centre of the gathered populace. Every person would announce their name in turn and, when fully completed, the team representative then had to name everyone around the circle. This was repeated with each rep. Sometimes we asked for a suitable accent, depending on the theme of the Night. This was a sneaky way of ensuring that, by the end of the four run-throughs, everyone had a good chance of picking up each other's names. A series of simple objects (eg a sandal, a juggling ball, a bowl etc) were laid down to form an obstacle course; we chalked a maze one year (but it rubs out too easily and causes disputes). Completing the course could be done a variety of ways. Having a blindfolded "horse" was one, where the piggybacking rider could only communicate with his/her steed non-verbally. Another way was to allow one team member to guide a blindfolded one by voice. For another game involving a blindfold, we pinned a picture of Michelangelo's David on the wall. Players were required to pin a fig leaf in the appropriate place; no voice guidance permitted. We provided bowls of cooked spaghetti and spoons and made teams race to transfer all spaghetti from one bowl to the other without touching spaghetti or bowls with anything other than the spoon. For Leonardo's War Machine, we gave each team chalk, 4 pieces of card, tape, stapler, knucklebone, broken arrow bits, 2 rubber bands. This was easy - each team had to make up a paen to their city, leader, clan etc. Or we gave teams 15 minutes to compose an opera (max 2 mins duration) to tell a story about their leader. Or two team members had 10 minutes to prepare a scene (max 2 min) of their choice from Romeo & Juliet, or the Merchant of Venice, or other suitable topic. No scripts were provided. Or a team member had to string together as many insults as possible against their chosen opponent (no hesitation, repetition or deviation). For all of these the stewards would judge based on length, style, cleverness and plausibility, not to mention the odd arbitrary ruling. Melee with boffer dagger, last one standing wins. Night of Champions was carried on by various others after we ran out of steam (ie during our young family phase), though the social engineering aspects were lost, which I think was a shame as they did serve a purpose. We produced this outdoor quest for Beltaine (AS31) as a means of introducing both a period story and some magic suitable for a spring event. The quest was based on The Mabinogion and Evangeline Walton's retelling of those tales, with a nod to Alan Garner's Owl Service. Gwydion (a high magician/demigod) tricked Arianrhod (his sister) into providing him with a son, Lleu Llaw Gyffes and, as a consequence, Arianrhod laid a number of curses on Lleu, including one which said that he could not marry a woman of the earth. So Gwydion constructed a wife for his son out of the flowers of oak, broom and meadowsweet and called her Bloudewedd (meaning "flowerlike"). One day when Lleu was away from his demesne, a neighbouring lord Goronwy Pevr came riding by. He was invited to dinner by Bloudewedd and they fell in love and plotted to kill Lleu. The only way Lleu could be killed was while he had one foot in water and one on land and with a special spear which took a year to construct. A year and a day later Bloudewedd asked her lord to demonstrate how he should stand, and Goronwy Pevr (who had made the spear) cast it at Lleu. It passed all the way through a rock and hit Lleu, who turned into an eagle and flew off. Goronwy Pevr then took over Lleu's wife, lands and title. Gwydion searched for Lleu and found the eagle (the legend says that bits of rotting flesh and maggots were falling off him and Gwydion followed a sow that was feasting on this). Bloudewedd, for her infidelity, was turned into an owl to be shunned by all other birds, and Goronwy Pevr, for his treachery to his peer, was doomed to walk the earth with no rest. It is desirable that all characters keep as formal as they can in their dealings with questers and try to remain completely in persona. Speak slowly, wait for silence, answer those who deal with you appropriately and ignore those who don't. key phrases: Had I known it would end this way I would never have brought her to him/created her. Who would have thought such beauty had such thorns? key phrases: It has ended as it began -- in pain and anger -- and rightly so. Look to where she came from for why she acted as she did -- she has no soul. Tokens: we used the owl/flower design from the Del Rey (1967) edition of Alan Garner's The Owl Service. The aim of the questers is to put together the elements of the story by interacting with the different characters. They have to work out that they need to undo the Dolorous Blow, by gaining the spear and throwing it back through the hole with the eagle standing on land and water. This will restore Lleu Llaw Gyffes and Bloudewedd to humanity. Once one of the teams got those elements in roughly the right order and place, Lleu and Bloudewedd came together, threw off their cloaks and masks, and were crowned with the flower chaplets. An Oriental Murder Mystery by Bartholomew Baskin and katherine kerr and a cast of thou�er, five. OK, six. This was run at the Kimihia Canterbury Faire in AS30, which had a Middle Eastern theme. Prince Alessandri has just been discovered with a knife in his back - a clear case of death by poisoning. Every (still-living) member of the cast has a likely motive for wanting to see the Prince off. Each is told what their motive is, but you won't know until the denouement whether you are the murderer or not, so be ready with a good confession, just in case. The actual murder mystery is reasonably simple, thus the principal enjoyment in the quest will be derived from the players interacting with the characters. Each of you will be told a few things you are allowed to pass on (though you won't know which items are true), and you'll be told roughly what the players must do to get the information out of you. You can also pass on basic information (from the cast list) about the other characters. Extraneous information that has no obvious relation to the core plot is quite ok (eg that hosteller serves watered ale). But please don't over-emphasise such snippets, and don't introduce your own red herrings. The players should persuade you to talk by recognising and appealing to some aspect of your personality (stated in your personal notes), not by overt bribery, fighting prowess or performances. However, by all means encourage them to perform for you, and reward it if you want. It's part of the fun. There is no need to give all your information at one hit, or in any particular order (let their questioning lead you whenever possible). Nor is there any need to be helpful to players who aren't trying to play well. However, as the evening wears on, we might ask you to make things a little easier so as to avoid dragging out the quest too long. Eavesdropping is permissible, if the party you are actually talking to are foolish enough to permit it themselves. But you are welcome to raise your voice and spout useless information in such circumstances if you want. If a party feels they have the solution, don't allow them to tell you - send them quietly to the quest stewards. If they're right (and a reasonable time has elapsed), we'll call the populace together for a grand denouement. learn and flesh out your character (without contradicting what you know of the plot). Also learn the names and occupations of the rest of the cast. Final points: Your possible motive for murder is the kind of information you'd definitely keep concealed from the players, so try not to tell them inadvertently. As for your alibis, which you should never volunteer, only supply if asked point-blank. These cannot be independently corroborated within the structure of the quest, though you can sound as convincing as you like. Possible motive: You believe the Prince was about to dump you and marry Princess Alix of Kiev at the Patriarch's urging. Alibi (if asked): What alibi? By your own admission, you were in the vicinity when the Prince was offed. Possible motive: The Prince didn't pay you for the beautiful golden coronet you delivered to him recently and you know he is in debt up to his eyeballs. How players persuade you to help them: With plain, clear, straight talking. The more smart-alecy they are, the less you tell them. Alibi (if asked): You had this fine enamel jewellery in the kiln, and could not possibly have left it untended. Character: You are quite pathetic at the moment, somewhat larcenous(eg inclined to pick the pockets of those talking to you), and somewhat over-trustful/naive. Possible motive: You were dismissed from the Prince's service after Begoria accused you of stealing food intended for his hunting dogs. You took up with the hosteller Berek, who persuaded you to steal a golden coronet which the Prince had recently had made. The theft coincided with the Prince's murder. You delivered the coronet to Berek, and he promptly kicked you out. Alibi (if asked): You never even thought of fabricating one. What a shame... Just say nothing plausible, badly. Character: You are a wheeler dealer, and a dishonest one at that, sly and crafty. Possible motive: The Prince ran up a huge gambling debt in your den. To recover some of it, you "persuaded" his former slave girl, Stephania to steal a golden coronet which the Prince had recently commissioned from the jeweller. You gave the Prince a drugged drink when he visited you on the day of his death, then sent Stephania in to get the coronet. When she brought it to you, you turned her out, knowing she'd only incriminate herself if she squealed... You definitely drugged him. If she stabbed him during the theft, you're as guilty as her. How players persuade you to help them: Greasing your palm, such as by buying something from the tavern, bringing tokens obtained from the gatekeeper. Alibi (if asked): You were keeping shop in the tavern... Honest. It's open as to who is the guilty party, so you can reward the best performance amongst the cast members and still keep it a surprise. Or you can let them know in advance if you want to. We rather liked keeping it a surprise. Swift Flight ran a Fools' Feast in September AS26. We randomly selected a King and Queen of Fools, who were given every encouragement by the stewards to take as many liberties as possible, which they did to very amusing effect. We had also privately organised an assassin to distribute the dreaded black spot. The deceased then took to their part with a vengeance, commencing a haunting the like of which has not been seen. Candlesticks flew mysteriously through the air, snatches of songs were heard as of out of nowhere and chill breezes and the rattling of chains were much in evidence. The feast had a variety of entertainment organised including a tale from Japan and a performance of Shakespeare a la Brucie. This was enthusiastically received by the audience -- most of the tomatoes missed. We closed the evening by bringing in a pine tree hung with star-shaped spiced biscuits, each with a feaster's name iced on, and paraded around the hall singing the wassail song.